Mr Ahmed Shebani, the founder of the Democratic Party in Libya, addressed the European Leadership Conference on 'Human Rights: Are Democratic Nations Upholding A Better Standard?' hosted by Universal Peace Federation and Women's Federation for World Peace on November 22nd in the UK's House of Lords, one of a series of events commemorating 'Parliament Week'. 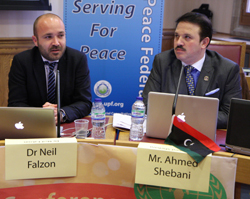 Ahmed Shebani addressed the distinguished audience on the illegal migration from Libya to Europe. 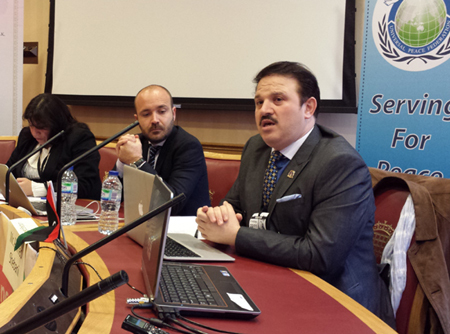 During an international conference organised by the European Leadership Conference on Human Rights on November 22 in the House of Lords entitled "Are Democratic Nations Upholding A Better Standard?" Ahmed Shebani, the founder of the Democratic Party in Libya addressed a distinguished audience on the illegal migration from Libya to Europe. He pointed out that every month thousands of disenfranchised Africans attempt to cross the Mediterranean from North Africa to Europe. Many of them meet a violent death at sea. To many these deaths are mere statistics, but the sad fact is that behind each death there is a real human tragedy. According to the World Bank, by 2050 there will be more than 400 million international migrants. This huge problem of illegal migration can only be solved with new thinking on the part of the international community at large. Mr Shebani said the Libyan revolution has not finished yet. It has just graduated to the next level that he calls "Deep Detoxification". “After 42 years of dictatorship we have to endure this process of internal cleansing as a natural evolution. Sadly, at some stage of the February 17 revolution you could get away with murder in Libya. All what you had to do was a person with a black skin point your gun and fire as you shout ‘Allah Akhbar’. Every black person was assumed to be a foreign mercenary hired to kill Libyans. Mr Shebani went on to describe the Democratic Party’s proposed launching of a major project, to be named Beacon 218, aimed at the integration of the African continent into the world economy. It will involve vast direct foreign investment in order to create a wide manufacturing base in Africa. This will create tens of millions of new jobs for unemployed Africans. Everybody along the supply chain should benefit; all the state actors and stakeholders have to play a role in managing this transnational problem, he said. “The starting point of this major undertaking will involve integrating Libya, the gateway to Africa, into the world economy. This process will have three components: ideological, political and economic. Mr Shebani believes that effective American leadership in the Middle East and North African region is essential in the form of a Marshall plan. If there is no economic empowerment at the grassroots level then the Arab Spring will be meaningless. Though Libya is neither in Europe and nor has it ever been part of the Commonwealth, Shebani said: “On the political front Libya should aim to join the European Union and the Commonwealth. This will provide a beacon of hope that will guide her politics for the next 25 years. “Endeavouring to meet the conditions of joining the EU will give Libya and all the countries of the Arab Spring a clear sense of direction as it did to Eastern European countries after the collapse of the Soviet Union.